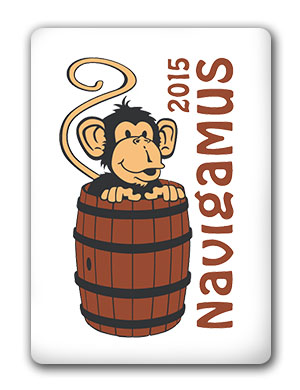 The name “Navigamus” is of Latin origin and it means “we are sailing”. 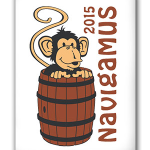 Navigamus is a national meeting of Czech water scouts which takes place every three years. A historical event is chosen as a theme. Scouts can get to know it through team games, outdoor activities and races. The mission of Navigamus is to meet each other and to make new contacts and friendship with both Czech and foreign scouts. At the same time, it is a representation of free time activities for children and young people for the general public, which can participate in it, so water scouting is presented as an international movement with educative mission. The 8th meeting of Czech water scouts took place 4. – 7. 6. 2015 at the Sec dam. Its main theme was the 210th anniversary of the battle of Trafalgar. The 7th meeting of waterscouts Navigamus 2012 took place from 7th to 9th June 2012 at the Big Bolevecký pond. There was a wide range of land-based and water-based activities. Main theme of Navigamus 2012 was 100th anniversary of maiden voyage of ship Titanic. Navigamus 2009 took place from 4th to 7th June 2009 at the water basin Rozkoš near Česká Skalice. An interesting programme was prepared afloat and aground. There were also traditional collective sailing and venetian night. Sindibad’s sailing was chosen as a motive of all activities. The fifth meeting of Czech water scouts took place on the bank of Hlučín’s gravel-pit from 7th to 11th June 2006. Its main theme was the 650th anniversary from the founding of Hanse, merchants’ association of medieval towns. The participants were divided into four groups, so-called Quarters, according to the area where Hanse was working – Prussian-Livonian, Saxon-Mecklenburg, Pomeranian and Rheinland-Westfalia. Campsite Břehy u Přelouče was another place of the international camp which took place from 5th to 8th June 2003. Its main theme was the 60th anniversary of the battle of Guadalcanal. The meeting of water scouts took place also in the magical year 2000, this time at the reservoir Seč. More than 900 scouts took part in it from 1st to 4th June. Its motto was the 300th anniversary of pirate republic of Tortuga. The second Navigamus with international attendance took place at the reservoir Orlík from 5th to 8th June 1997. Its theme was the 500th anniversary of the Portuguese seafarer Vasco de Gama’s sail around Africa. The first national meeting of Czech water scouts with international attendance took place at the reservoir Orlík from 2nd to 5th June 1994. The theme was inspired by the 50th anniversary of invasion of Allied Forces to Normandy. There was the first regatta of canvassed pramice with original rigging “Scout” too.